Pedro : This is the life, hombre. Nothing could make it better. Fernando : We could be in Catalonia. Pedro : Apart from that. Nothing could be better. Fernando : You say that but flies keep landing in my wine. Fernando : What do you think I am? English? I like to savour my wine. But I want to savour it without flies. Pedro : Well, put a lid on it. Fernando : A lid. (picking up his glass) This is not one of those tupperware containers widely used in picnics. It is lidless. Pedro : Put a beer mat on it then. To act as a lid. Pedro : You need to put something on top of the mat. Waiter! Pedro : Bring me a morsel of cheese. Pedro : Place the beer mat on top of the wine glass and the morsel of cheese on top of the beer mat to stop the wind blowing it off. Pedro : Do you know what? I think I’ve invented a whole new cuisine which will one day sweep the world. Pedro : When you’re feeling peckish you just eat the cheese. Who doesn’t like a morsel of cheese with their wine? Fernando : We could have just gone inside. And so tapas (which really does literally mean lid) was invented. But what began as a tempting morsel of cheese has mushroomed into all manner of foods of all manner of shapes and sizes (though surprisingly few of them feature actual mushrooms) many of which if nowadays placed on top of a wine glass would promptly shatter it to smithereens. So take care when trying to act overly authentic – there is nothing that spoils an authentic look more than soggy trousers. 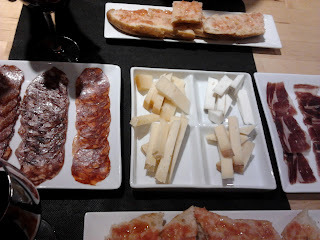 But through the myriad of dishes the BigBarcelonaBlog has ploughed to come up with a basic guide to what to order when confronted by that tapas menu. You are doubtless thinking about what a generous action that is on the part of the BigBarcelonaBlog. You are further thinking how indebted you feel to the Blog and wishing that you could do something to demonstrate your gratitude but "Alas!" you cry. "We are separated by oceans and time zones and I can think of nothing to do." Despair not! Simply take a moment to click on one of the adverts from the Blogs lovely sponsors and your debt is wiped away. If only it were that easy for Greece. Thank you. Now back to tapas. Obviously you can just go with the original concept of tapas and have one as a nice snack. 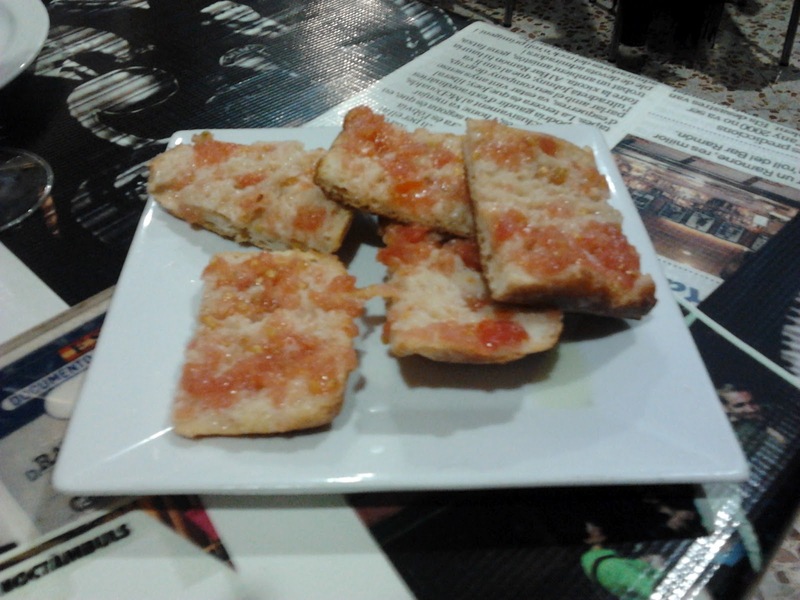 But the BigBarcelonaBlog believes that tapas is just too nice to be a snack. Especially when it could so easily be a large, tasty meal instead. 1) Beer or wine. For while you read the menu. 2) Pan con tomate. This is a baguette which has been rubbed with garlic and then spread with a crushed tomato and drizzled with olive oil. It is the basic building block of all tapas and is a mandatory selection. To leave it out would be akin to eating bacon and egg without bacon. Or egg. 3) Patatas Bravas. This heavenly castillian dish fuses the best things about roast potatoes with the best things about chips and then serves them with garlic mayonnaise (all I oli) and spicy tomato sauce (the bravas sauce itself). It is done slightly differently in every single bar/restaurant in Spain. It is so important that it warrants a blog entry of its own which I will link to when I’ve…er…written it. 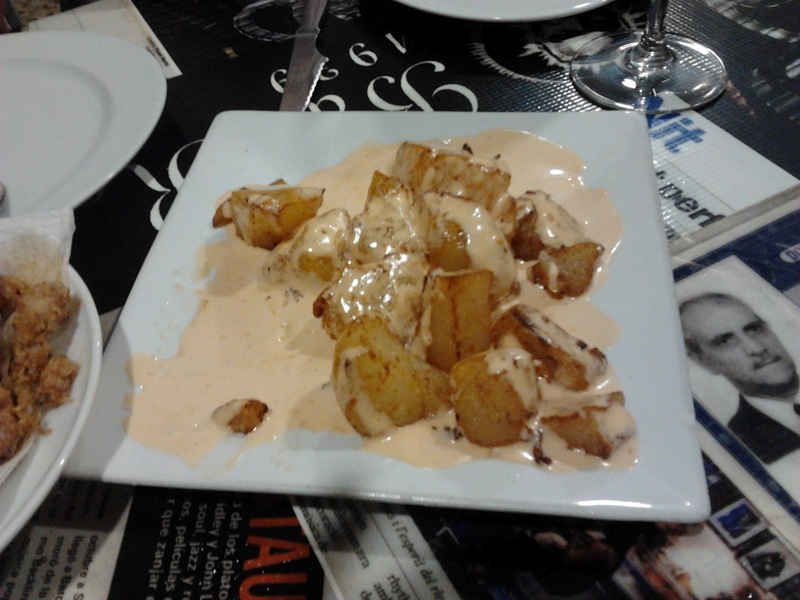 To eat tapas without bravas is akin to eating bacon and egg without bacon. Or egg. Or a mouth! Tapas No 2: Pataas Bravas - better than Roast Potatoes! 4) Pimientos del padron. These little green peppers deep fried and well salted are delicious and add an entirely deceptive healthy appearance to your meal. The above choices as I specified are mandatory and so not really choices at all. However, never let it be said that the BigBarcelonaBlog is not prepared to be flexible. I would suggest picking two or three from the following list to add depending on the size of your party and your stomach. 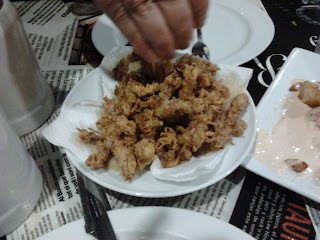 5) Chipirones/Pescaditos Fritos/Calamares a la Romana. Any of these will do as an excellent fish component. Chipirones are tiny fried squid. Pescaritos Fritos tiny fried fish and Calamares a la Romana are bigger squid fried in batter. You will notice from the preponderance of the word fried why the healthy sheen of the Pimientos del Padron is nothing but a veneer. I would rank the fish dishes in the order I have listed both for originality and for taste. Tapas No.3 : Chipirones. Tastier than they look! 6) Jamon. There is often a large ham on the bar from which you can watch your racion being carved (a racion is a normal portion). Order Jamon Iberico if you want the best stuff. 7) Queso. You’ll get a plate of cheese. Often a delicious manchego – Spain’s best cheese and criminally underappreciated in a world where people chomp away on faux cheese monstrosities like gouda, edam and emmenthal. It is optional to place it on top of a beer mat on top of your wine to recreate the magical moment when tapas was invented and to draw confused looks from tourists and locals alike. 8) Tortilla. The classic Spanish omelette will normally come as a substantial doorstep rather than a willowy pancake type thing. It is all the better for its solidity. 9) Croquetas : Normally a mixture of béchamel and ham (though it can be spinach or mushroom or other stuff) fried (there’s that word again) in breadcrumbs. 10)Pulpo Gallego. This is octopus as cooked in Galicia. It sometimes comes with potatoes and sometimes doesn’t and is sometimes delicious and sometimes not so delicious. It is normally more expensive and often bigger than other tapas. So bear that all in mind. The BigBarcelonaBlog sometimes feels that the drawback with Pulpo Gallego takes up space that three other tapas could fit into instead. But it is certainly a classic tapas dish and if you’re feeling adventurous then why not? 11) Another glass of beer or wine because all that choosing and ordering has really taken it out of you. All you’ve got to do now is eat it. Oh, and know the best places to go. But that will be the next entry. ¿Hay tapas? – Do you serve tapas? Quiero una caña/un vino tinto/blanco, please? – I’d like a beer/red wine/white wine, please. La cuenta, por favor – The bill, please. Camarero, hay una mosca en las bravas – Waiter! There’s a fly in my patatas bravas.